The regular news digest of the People’s Movement, No. 147 is out now. It can be freely downloaded from the People's movement website and this issue has articles covering TTIP and a trade union view on Brexit. Recently Greenpeace published details of secret negotiations between the EU-US which were leaked and they indicated that EU officials had completely sold out to the US on all their corporate agenda demands. The TTIP agreement is by far and away the most undemocratic agreement ever devised and will shred protections of all kinds and oblierate the sovereignty every state that has this imposed on them. However the mainstream rightwing corporate media is not covering what is in TTIP and simply make false statements that it will bring jobs and growth, where the core issues are central to what it means to how society right across both the EU and US is run. Naturally our own mainstream political parties of FG and FF are completely for this corporate power grab of an agreement. 1. 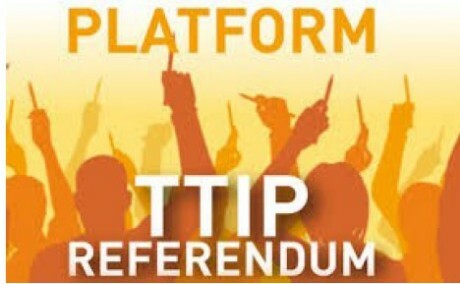 Can we look forward to a referendum on TTIP? 2. Onward to a federal EU! Can we look forward to a referendum on TTIP? The Transatlantic Trade and Investment Partnership is being negotiated at present between the EU Commission and the US government. The Commission argues that the European economy could benefit to the tune of €199 billion a year. The Irish Government is firmly behind TTIP, despite staunch opposition in much of Europe. One of the most controversial aspects of the proposed agreement is the inclusion of an investment court system, which, critics argue, would give corporations the power to sue sovereign states in trade disputes. 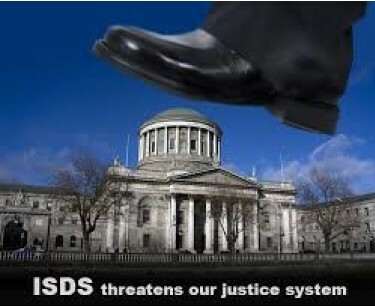 In a potential blow to the Government’s and El’s hopes for an agreement, legal opinion seen by the Irish Examiner claims that such a court system to be ratified would require a referendum. • certainly infringes article 34.3.2, which makes the High Court and the appellate courts above it the sole courts in which a law may be questioned. Perhaps it’s time to prepare for another referendum? Onward to a federal EU! A leaked EU document, published on 19 May, reveals that European governments are secretly planning to introduce a special justice system for business investors throughout the EU. The plan seeks to establish a set of legal privileges for corporations, undermining national courts and creating a parallel system open to foreign invest ors alone. The proposed ISDS (investor - state dispute settlement) mechanism is already highly controversial. It would allow transnational corporations a unique power to challenge any new laws or regulations that could adversely affect their profits in futu re. The EU also plans to extend the power to North American corporations in the proposed TTIP and CETA (EU - Canada) agreement. The EU public consultation on ISDS generated a record participation of 150,000 responses, with more than 97 per cent saying they did not wish to see such powers introduced. But the EU Commission has ignored the findings of the consultation and is pressing ahead regardless with the introduction of the new powers. The proposal was tabled in secret at last month’s EU trade policy committee by the governments of Austria, Finland, France, Ger many and the Netherlands and was followed by the publication of a similar proposal on the web site of the lobbying group Business Europe in what appears to have been a co-ordinated action. It seeks to remove the existing set of bilateral investment treati es between EU member - states and to introduce an all - embracing right for businesses to sue throughout Europe as a whole. The document was brought to light by the European trade campaign Seattle to Brussels Network, of which War on Want is a member.